Whether you know you’re in need of foundation repair in San Antonio , or you make it a habit to inspect your home regularly, you should add “checking the foundation” to your list of regular home maintenance. If you can catch a small problem early, such as a crack or leak, it hopefully won’t turn into a much larger problem later. Here are some tips for examining your home for foundation issues. If you notice that doors or windows, which used to open easily, are jamming often or won’t close at all, you might be in need of a foundation repair. Cracks, inside and out, may be your biggest alarm that there is a problem, though. When you notice cracks appearing in your walls or in your tile—if it’s tiled over a concrete floor—you should make it a point to call a contractor who specializes in foundation repair. Also, check your basement or crawlspace. The posts and concrete supports, otherwise known as piers, should look straight and firm. If you notice any puddles or wet spots around the framing, you may have a problem with drainage coming into the foundation. When you walk the perimeter of your foundation, stop at each corner and look down the line for any leaning walls or bulges. This might be a sign your foundation has shifted or your soil underneath the foundation is shifting. Consult a foundation repair contractor who can give you a definitive answer and suggestions. If you notice your concrete foundation is flaking or chipping, poke the concrete with a screwdriver. The concrete shouldn’t be damaged, but if it chips even more, call your contractor right away. 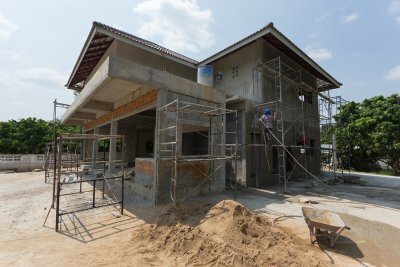 The concrete might have originally been made from a bad mixture, and it’s possible you will need a new foundation. It’s normal for concrete to have a few cracks, but if you notice horizontal cracks, you may be in trouble. Call your concrete contractors to find out what the problem is and the estimate to fix it.